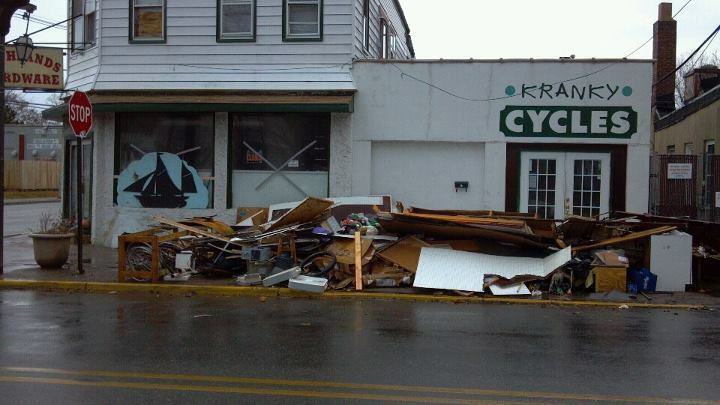 Always willing to help a fellow cyclist in need, we’ve put up this guest post by Roger Sherman who is on a mission to save his favorite bike shop that was recently destroyed by Hurricane Sandy. So far they’ve raised $4,590.00, on their way to a goal of $15,000. I first met Garrett Newcomb a little over nine years ago. At the time, I was thinking about getting into cycling strictly as a form of transportation; I had been driving 17 miles each way to work and back, and the amount of gas it was using (mind you, this was well before the price of gas had shot up the way it did in ‘08), along with the wear and tear on my car, coupled with the knowledge of how much pollution I was putting out there made me want to find a better way. So I contacted a cyclist friend (my dear departed friend, Cheryl Jiosne, RIP) for some advice on what I should look for, in terms of types of bike, price range, etc. And she recommended I call Garrett, at the bike store that he worked at the time. Garrett is exactly the guy you would want to buy a bike from. He’s got broad and deep knowledge of all the bike lines he sells, and he had no problem taking what turned into a couple of HOURS of questions from me, as I looked at and tried several bikes out. And while his boss pulled him aside at one point, to pressure me into buying right there and then (I found this out years later, and had that happened, I would have walked out), he had no problem letting me take the time I needed to make my decision – even though at the time, that meant letting me walk out of the store, and taking a couple of weeks to make my decision. Over the years, we’ve become good friends, hanging out outside of work, riding a lot – he even manages to drag me out on mountain bikes once a year or so (gasp)! And over the years, I’ve gotten to the point where he’s the only person I’ll let work on my bikes. The organization that goes into how he thinks, and the remarkable attention to detail that he brings has set a standard that I’m not willing to see if anybody else can match. Many of us in the area were delighted when he set out on his own, and opened Kranky Cycles. Then just months ago, he ran into trouble after being 7 feet underwater during and after Hurricane Sandy came to town. Now we all want to rally and help him out. Unfortunately, FEMA won’t help him, since he’s been in business for less than two years. I spoke to him about getting a charity ride together, in hopes of raising a couple thousand dollars, but he told me that at this point, they’re looking at far more than that in repairs and renovations – they literally had to gut the store after Sandy. Of course, now he’s only able to work out of his house, and his income has been greatly cut down. And so we turn to the cycling community beyond our local area, in hopes that enough of you can spare $10 or $20 so that we can reach the rather daunting number he needs to keep things moving. We’ve already made a lot of progress, but more help is needed. And I don’t know anyone that deserves it more….who is more willing to help others in need, and put out for others than my good friend Garrett. Besides, I’m still riding that bike that I bought from him (which is now just the first bike that I’ve bought from him), and I need to get it serviced soon. So help him get those doors back open. A great shop and mechanic and well worth giving up your Latte for the week to help out. I really hope Kranky’s can come out of this ok. Please please please help! Even $5 gets Kranky’s closer to it’s goal.